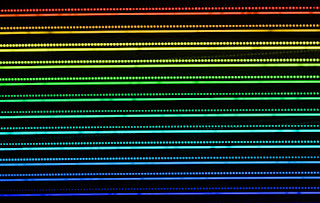 An example of the spectrum from two laser frequency combs, with their evenly spaced emission lines. (Courtesy: ESO). A new type of laser frequency comb (LFC) has been developed by scientists in Europe. The prototype device could lead to improvements in how scientists search for Earth-like exoplanets, measure the expansion of the Universe and test the fundamental constants of nature. LFCs produce spectral lines of light with evenly spaced frequencies and have a wide range of applications in metrology and spectroscopy. The new LFC was developed by Tobias Herr of the Swiss Centre for Electronics and Microtechnology, Francesco Pepe of the Geneva Observatory and colleagues. It uses a laser-driven microresonator on a silicon-nitride chip that produces 24 GHz pulses for use in calibrating near-infrared spectrometers. This gives it an advantage over traditional LFCs, which operate at frequencies below 10 GHz and create a line spacing that is too small for astronomical spectroscopy. The pulses are produced by way of a phenomenon known as temporal dissipative Kerr-cavity solitons (DKSs), which involves trapping ultra-short pulses of light in a circular, micron-sized microresonator. Each time the DKS pulse passes the microresonator’s input-output coupler, some of the pulse is siphoned away and directed towards the spectrometer, producing a series of spectral lines that, in the prototype, are each precisely 24 GHz apart. 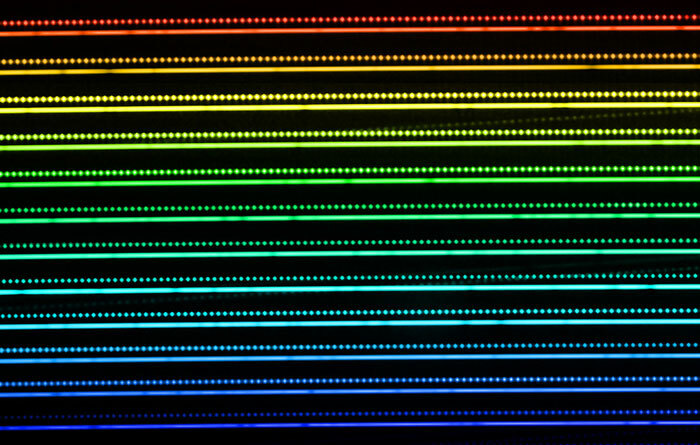 These lines form a spectral comb and act as a precise calibration tool for the spectrometer. One popular method of detecting exoplanets is the radial velocity technique. This involves measuring a star’s subtle motion that is caused by the gravitational tug of an orbiting planet. These motions are often no faster than walking pace and require highly accurate spectroscopic measurements of the Doppler shift in the star’s light as it moves. The size of the Doppler shift and the period at which it occurs can tell astronomers both the mass and the distance from the star of the planet. The greater the mass of the star, or the less massive or more distant the planet, the smaller the Doppler shift.